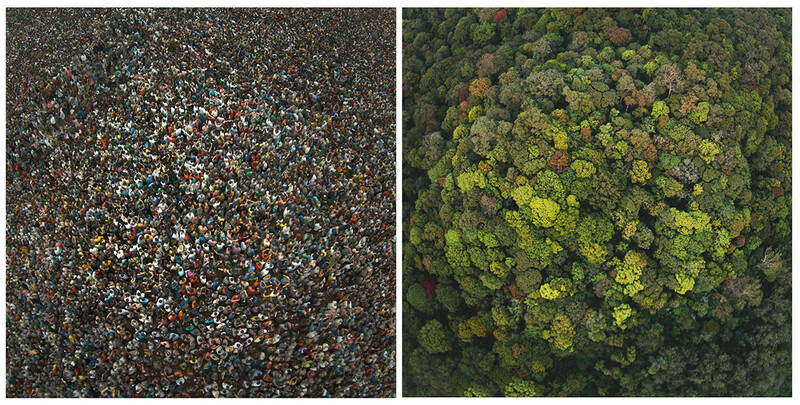 The two aerial photographs above best describe why conservation in India is so hard. As per government records, some 350-400 million people depend on the forests and yet about 22% of India is still under forest cover. Mr Kalyan, these photographs of yours are awesome, kudos to you. However, is it fair to have resorts in protected forests? i believe you worked at Gorukana in BRT for some years as your INK talk goes by, is it fair? Don’t you think it would be better if these forests are outside the reach of humans? There are some reports where in some photographers and resort owners have arrangements with forest dept officials and go in to deep places which are pristine? I would like to hear your word on this. I think everyone needs to see things in context and not in absolutes. Wildlife tourism is a critical way in which people can appreciate nature and with safeguards, eco-tourism is generally good for the forests as well as for the people. I do agree with you 100% that there should not be resorts *inside* protected areas. If you look at BR hills, there is Jungle lodges in Kgudi which sits right in the middle of critical tiger habitat (core area). Gorukana resort is a non-profit run by the Soligas which is in revenue land outside the boundary of the protected area. Also 100% of Gorukana profits go for healthcare and education for the Soliga communities. Regarding your last point, I do not know if it happens in other places, but I know that it does not happen in Karnataka. I’ve been to K-Gudi, & Bandipur. Honestly it is an awesome experience at BR Hills. The officials at the resort and the Rangers are doing a wonderful job in keeping the jungle and animals safe. Bandipur had wild fire this summer.. but Even with a resort in its core area and which is full almost in all seasons, K-Gudi was safe and not even a single fire was reported. In fact at K-Gudi, everyone gets the feel of living inside a core jungle.. that too in Tents or Log Houses, and the interaction with those officials makes everyone respect wild life and the jungles. 2nd day of our trip I saw mine and my friends kids picking their cookie packets and leaving it in the dustbin, which they never do. They did not make noise on our Safari. And I am talking about 3 year old and 5 year old kids. These kinds of resorts gives us a chance to teach our children about wild life and give them that experience which I am sure 95% of Indians never had. Kalyan, the manager at K-Gudi did tell us about you and your service there. BTW the clicks are awesome. These both photos are simply awe inspiring !! Awesome Photographs. Keep on inspiring. Awesome description Kalyan and an amazing capture ariel shot. Very true, High human densities and their demand for co-existence have certainly put a massive drain on India’s fragile ecosystems & biodiversity. Thanks for sharing. Bandipur is a standout amongst the most wonderful place in India and extremely sentimental perspective for honeymoon couple and gang. Thank for offering information about Bandipur Resorts place. On the off chance that you need to use occasion travel and special first night then book open to Whispering Woods and revel in. Great Website With such an beautiful pictures. Love to visit your site, Thanks for sharing this. Hi kalyan..I read your story in connect the dots book by rasmi bansal. I came to know about ur interesting stuff..its really inspiring. I wanted to be like you yar..please advice!! The best story teller images. How and why Conservation is difficult but critical. Also, Its essential to conserve nature to be part of it. And i feel people visit these places to better understand, self educate the importance of forest. But, on contrary people go to forest and rather than spending time enjoying and appreracting the Forest and its creations, spoil the habitat by spilling the waste and plastic. Am happy that infamous BR hills, still remains remote to people. Less polluated in critical tiger habitat. (I strogly agree that its polluated in the temple region). Thanks for the images sir. Inspiring. Missed a chance to meet you last time. But will definetly try to meet you again!!! A very strong message can be seen in these two photographs. And now it makes me follow you. 🙂 great Job!!! Amazing! It has a strong message and impact! Great site! Having a decent have has a huge effect when you visit spots like Bandipur. I have gone by Bandipur more than once and have discovered a flawless match with Bandipur Safari Lodge It’s a brilliant mix of great administration and extraordinary nearby information. Makes the stay all the more beneficial. Thanks for sharing us very beautiful clicks. yes, eco-tourism is good for the forests as well as the locals but minimalist living (e.g camping in tents or village homes) should be encouraged for eco toursim and not build resorts.